Marcia Nodel is a chef, a mother, a yogi and a dog-lover. Born in Pittsburgh, PA, Marcia has lived in Miami, Florida, West Bloomfield, Michigan and Albuquerque, New Mexico. Her journey has allowed her to gather and eclectic range of cooking techniques which she applies frequently to her home-cooked family dinners and holiday meals. Among the most popular dishes in her kitchen are her versions of green chile gravy for thanksgiving, grilled peach roasted chicken. She began making caramel corn as a weekend treat for her kids over 30 years ago. Over time, her caramel corn, pickles, jams and fancy nut mixes gained popularity among friends and family who always wanted to have her delicacies stocked in their pantries. After deciding that others deserved a taste too, Marcia began selling her artisanal snacks at gourmet food stands in Southeastern Michigan. In January 2014, Marcia’s Munchies Sweet N Sassy bread-and-butter style pickles won a national Good Food Award and Marcia was presented with a medal from Alice Water and Ruth Reichel at the Palace of Fine Arts in San Francisco. 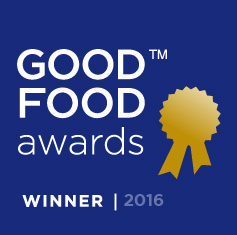 In January 2016, Marcia’s Cherry Pops – pickled baby tomatoes – and Little Hotties – spicy bread-and-butter pickles were selected as Good Food Awards winners. Marcia gave the acceptance speech on behalf of all of the winners in the pickles category. Healthy snacks are special treats to be enjoyed with friends and family that are aligned with an all-natural diet and way of life. Healthy snacking promotes foods that are free of harmful synthetics or additives while recognizing the joy of delectable goodness and the enhancement it offers any occasion. Are Marcia’s Munchies good for you? Marcia’s Munchies products are always made fresh, with all natural ingredients. The main ingredients for Marcia’s Munchies pickles are hand-picked and packaged to ensure that their peak freshness is tasted in every jar. Michigan State University’s Culinary Service and Community Partners Program works with Marcia’s Munchies to select local products, free from GMOs and synthetic ingredients. All Marcia’s Munchies products are made fresh with all natural ingredients. Marcia’s Munchies pickled products have zero fat and gluten free. You can be sure that everything in a jar of Marcia’s Munchies pickles is hand-picked and packaged to ensure peak freshness and maximum taste. Marcia’s Munchies works with local products, free from GMOs and synthetic ingredients. What is the best way to eat Marcia’s Munchies pickles? The Sweet ‘N Sassy and Little Hotties pickles taste wonderful on gourmet sandwiches or are a great snack on their own.